The green at the short par-4 3rd, with the marsh right. 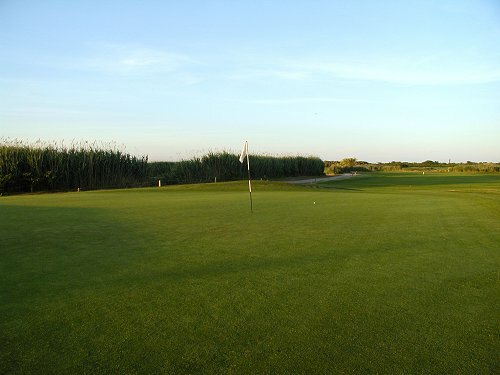 Description: The original course is now barren land, but across the street from the old site is a real links-style gem situated between the Atlantic Ocean and Reynolds Channel. Designed by Robert Trent Jones in 1948, the current layout has breathtaking views of the water and offers some real wind-swept holes that echo the old design. Reader Comments: It’s such a great facility, I would want to play it every day ... Changes every time I’m out there, and every time it’s a new challenge ... A real “bear” when the wind is blowing ... 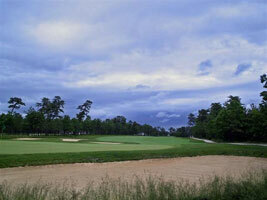 Some of the best holes on L.I., period ... Wonderful condition the whole year. Description: Feeling like it was carved out of the Long Island Pine Barrens, this tight layout was a unique addition to the area when built in 2005. With a nice piece of land that had all of the natural terrain and features for a great golf course, the crew here has done a great job since Day 1. Offering areas of waste bunkers that often rub up and intersect with the high-standing pines, the general ambiance of the course is reminiscent of the Carolinas. It is a real shotmaker’s course, requiring precise drives through pine-framed corridors and the negotiating of immense, subtly breaking greens. There are a lot of places you can get in trouble, both off the tee and around the greens, so precision takes precedence over length. It’s always in great condition, making it a fair and stern test of golf. Reader Comments: A gorgeous go-around. I’d do it again tomorrow. You need to be sharp tee-to-green. Some really great holes out there. A private club experience at daily fee prices.